Welcome to another post in the Real Living series, where I’m showcasing real homes from real people, giving us in insight into what turns a house into a home. We learn what makes a certain room special to the homeowner and get a real sense of what homes are really like, not just what they look like in magazines. And so this week I’d like to welcome Jenni from Ginger Bisquite who is sharing her son’s new nursery, and gorgeous it is too! This is my son Aneurin’s nursery and I love this room because it was the first room in our home that felt truly complete. Our whole house has had a lick of paint but there was always the feeling that they need those finishing touches that I never get round to finding. For this room it was easier to justify those little extra touches because I wanted the environment to be truly personal and stimulating for a baby and then a toddler. 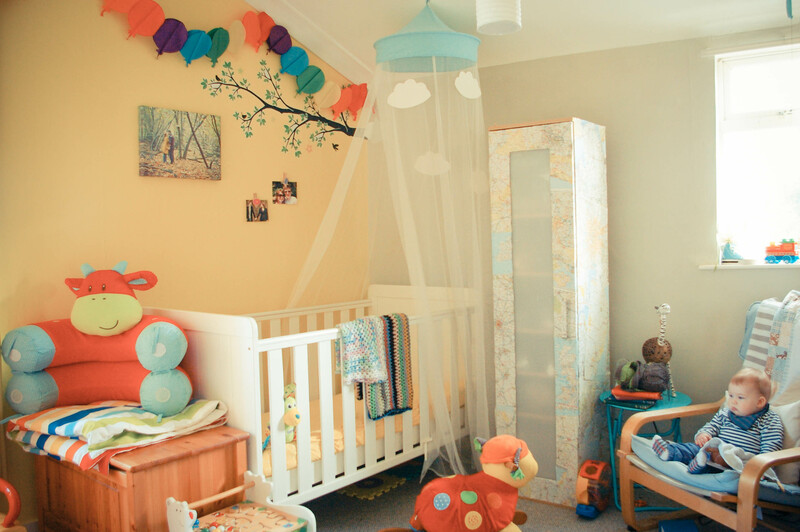 The nursery was a labour of love, and it felt like a journey of giving up a room of my own, to making a space for this new person who was soon to take over our lives. When I first started decorating, it was very early on in my pregnancy when we didn’t know if we were having a boy or girl. I have to admit it was nice to have an open mind without being bombarded by thoughts of blue and pink. I was keen to really change the feel of the room from my office, which was cream and cranberry, to something full of light and fun. I chose the paint because it was on sale at the time, but in the end it worked out as the perfect colour, (even though my husband was initially dubious.) The yellow now seems to go with everything as it has been tempered down by the alternation of grey walls. The grey and yellow together have been a good base for what has turned into a bit of a rainbow room, full of brightly colours toys and artwork. My favourite things about this room is the amount of storage we have managed to cram in. It is true what they say about storage, now I have a room that has been properly thought through it is possible to keep things tidy. Even when things look catastrophic and everything has been pulled out and off shelves, everything has a place to go back to. We got all the furniture off freecycle, the cot bed had a good scrub and a new mattress, I left the pine units as they were and I decoupaged the tall cupboard with spray glue and maps which reflect places that mean things to us as a family. Wow Jenni, thanks for sharing this with us, the room looks absolutely divine. I love that you’ve managed to put together such a stylish room without spending a fortune, and I love that you’ve created a space that both children and adults will enjoy. I know I get overwhelmed by toys and clutter in my girls’ rooms sometimes so I’m glad that you’ve found your storage solutions to be working for. Yay for storage, you can never have too much! And do tell us if you have a tutorial for creating that fabulous map covered wardrobe! I’d love to have more rooms to feature on Real Living so if you’d like to show us your favourite room in the house, no matter what it looks like, we’d love to see it and to hear why you love it. Just email me at jen@lovechicliving.co.uk to find out more. Beautiful and tons of fun i love this nursery! I love the maps on the cupboard, that looks amazing! I was lucky enough to meet Jenni at Cybher recently and will be moving near her soon. I think I’ll invite myself round to see more of this lovely home! I think you definitely need to pop round for a cuppa Di, when you move. How fab that you both met up! Thanks so much for the lovely comments everyone, and a big thank you to Jen for letting me be a part of the Real Living series. And thank you for taking part Jenni, hope you’ll come back soon and show us more of your lovely home! That is a very sweet nursey, I love the maps on the units and the balloons on the wall. Locely choice of colours! Thanks Amanda, I’m loving that maps idea too.